Save up to $5000 on your Bathroom Renovation! If you are renovating your bathroom in the next 12 months this offer is right for you. Schedule an appointment to discuss your Bathroom renovation project details with our bathroom design expert & find out how Aqua-Tech makes ‘Bathrooms Beautiful For You”. See some of how our 40 years’ experience has led Aqua-Tech to be the premier Bathroom company in Winnipeg. Fill in the form on this page to schedule an appointment with our Expert Bathroom Design Consultant and save up to $5000 now! Did you know Aqua-Tech has one of the largest bathroom showrooms in Winnipeg! This offer expires October 31st so act now as space is limited for available appointments. All consultations will take place at the Aqua-Tech showroom and MUST be scheduled in advance. 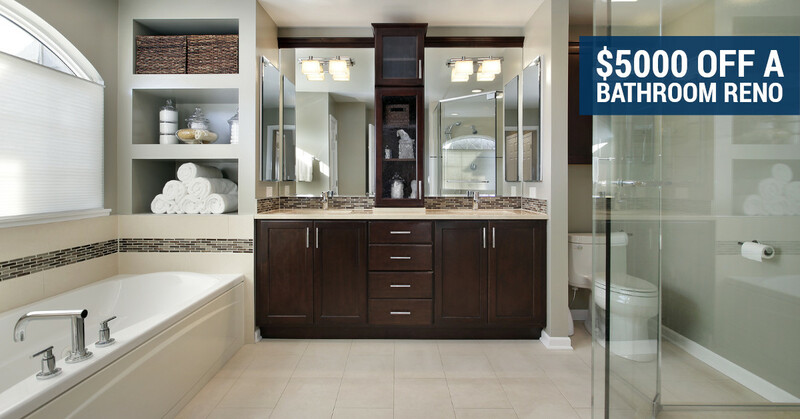 Save up to $5000 and schedule a FREE appointment with our Expert Bathroom Design Consultant!